Coffee was first planted along the Kona coast of Hawaii in 1817. Kona coffee, grown in the soil of volcanic mountains, is very expensive. Often Kona coffee is blended with other beans. In 1997 about two million pounds of green Kona coffee beans were harvested. 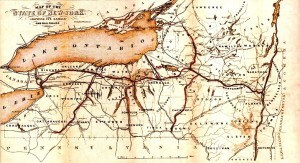 Construction of the Erie Canal began in 1817. The Erie Canal opened on October 26, 1825. It joined the Atlantic Ocean (via the Hudson River) and Lake Erie. Approximately 363 miles long, it had 36 locks. Previously goods had to be shipped by wagon and pack animals. The canal cut transportation costs by 95 percent. Children can view an excellent video at: Erie Canal. The Philanthropist, the first abolitionist newspaper, was printed in 1817. Charles Osborn published the newspaper in Mount Pleasant, Ohio. Mississippi became the twentieth state in the United States in 1817. Its nickname is the Magnolia State, and its name comes from an Ojibwa phrase, misi sipi, meaning “great river.” Jackson is the state capital. The state ranks thirty-second in area and thirty-first in population. Hernando de Soto explored the area around 1540. The state water mammal is the porpoise. Children could visit an Internet site at: Mississippi. Children love to spell Mississippi. Conduct a spelling bee, using states as the category.